A pergola with a difference! 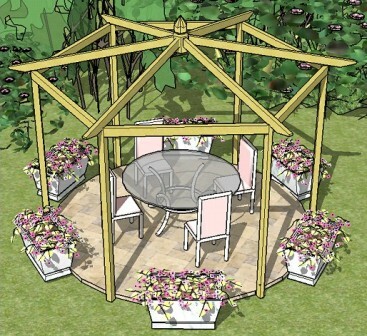 If you'd love to build this pitched roof hexagonal pergola, then these plans will show you, step-by-step, how to create this wonderful design. 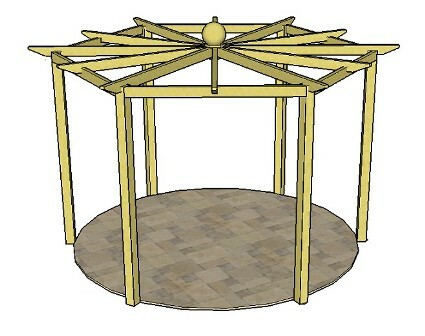 With its radiating rafters, it can be built as a free-standing feature, or as an attached pergola next to your house. Now there's something to think about! The inward facing frame makes it very cosy and welcoming; ideal for both relaxing and entertaining. Add your perfect garden furniture and planting to make it a truly unique space. The plans include the flat rafter style, too, in both the six and twelve spoke design. The pitched roof feature has been included to give more options for mixing and matching design features. 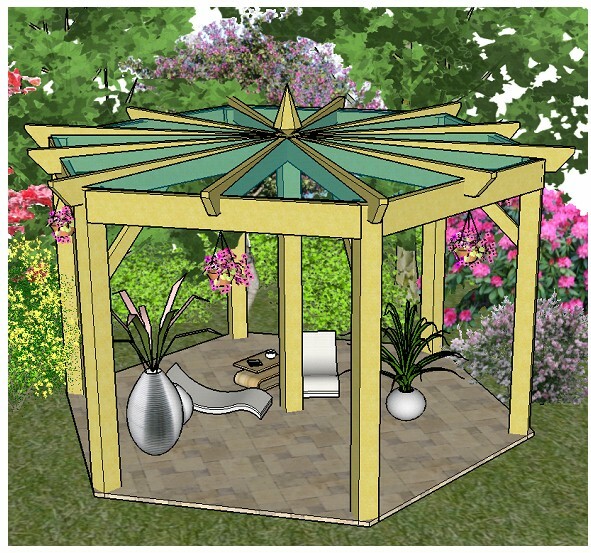 All the plans that have been developed for the Additional Pergola Plans Series have been created for someone who has a specific idea of the pergola they would like to build in their own garden. This is what happened when Julia contacted me about the hexagonal pergola plans (although many people have asked me, over the years, to adapt the plans for them!). She is embarking on a sizeable project in her new home in Tuscany. She emailed me with her vision. 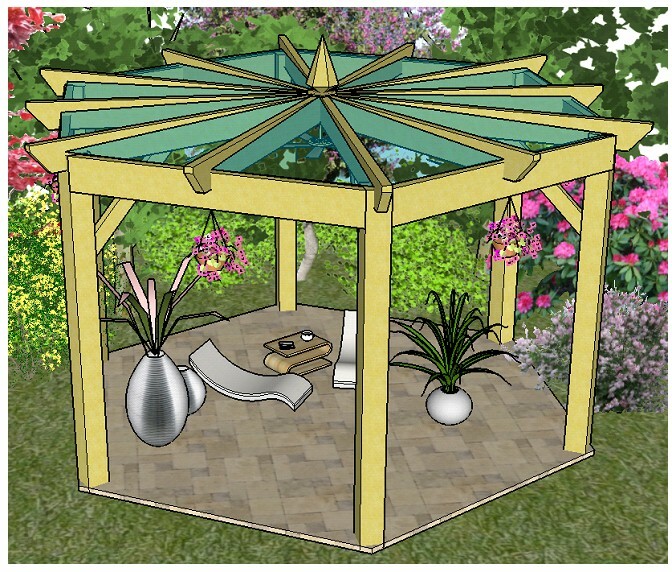 We are interested in your plans for the hexagonal pergola/gazebo but we want it to have a raised roof - a pitched roof hexagonal pergola. Do you have any adaptations or suggestions? 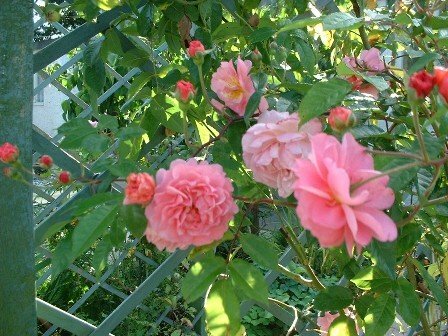 It is for a formal rose garden to be planted with light pink roses and to evoke the feel of a wedding cake. 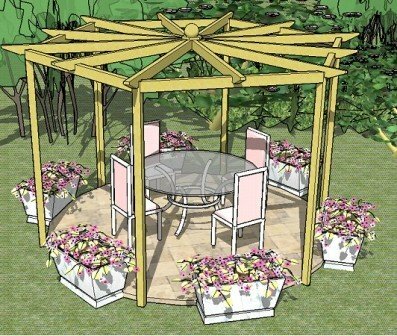 As always, it was important for me to bring this idea to life and create plans that could be easily understood, showing how to construct the pergola in several different ways in order that the plans could be adapted to suit everyone's individual taste and style. Like all of the plans, there are several design options to suit many style preferences and situations. This design has fantastic angled rafters radiating from the centre. Alternatively, build your pergola with flat rafters. This pergola design has six radiating rafters that sit fully on the top of the supporting structure. It's very easy to build this way, as there is very little notching. Find out how to attach it to the frame easily. This one uses the same frame as the pitched roof hexagonal pergola. 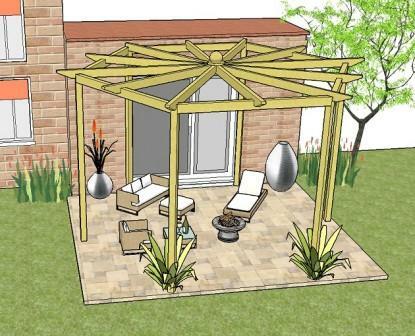 In fact, all of the design options for these pergolas are based on this frame. Here we have the twelve spoked design. The picture shows raised rafters, notched to fit over the frame, and an optional finial, just to round things off! A notched rafter is very pleasing to the eye, giving the whole structure a feeling of unity. Here is the same design attached to the house. This can be done in two ways. Find out which is best for you. Build it with flat or pitched rafters. What a beautiful structure you will have on your patio! Trellis panels add shelter, and more places for beautiful climbing plants to grow (always a bonus!). 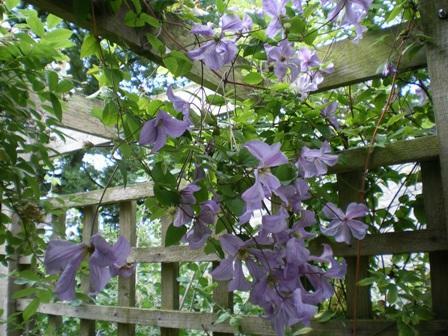 Place them on one side of your pergola to give shelter, or position on alternating panels for a decorative effect. This hexagonal pergola design was created for Quincy, from the US, who wanted a large, covered hexagonal pergola. The posts and rafters were drawn to scale for this large pergola, and the roofing carefully angled to 'drain the rain', so to speak. The braces were extended well into the radiating rafters to cut down the span considerably (there being full supporting rafters running across the entire span, too). This could also be built as a pitched roof hexagonal pergola, with the pitch creating a very strong structure. Another option, to ensure stability of the rafters, particularly for larger pergolas, is to use a centre post or pole as an attractive design feature. Trinkets, lights and plants can be wrapped around it, or even an integral table or bar area created. Mix and match any of the ideas to achieve whichever style you like. It's all explained in the plans. Fix your pergola to the ground in different ways. Adjust the dimensions of your pergola. Have fabulous rafter tail end designs (templates included). Choose different ways to fix your radiating rafters to the frame. Build your pergola next to a house or wall, making it look like an attached pergola (very effective). Have pitched or flat rafters. If you prefer a more formal look, try using planters around, or between, the posts. 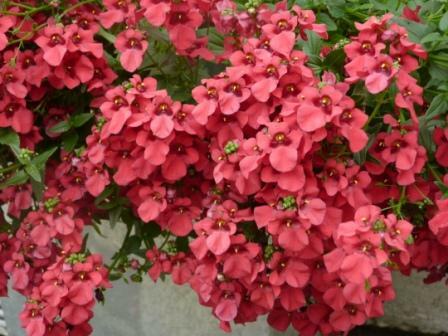 This large zinc planter gives a modern twist, while the gorgeous diascia softens the effect. Only one plant? Let's not get ahead of ourselves, though. Let's take a look at the pergola footprint. 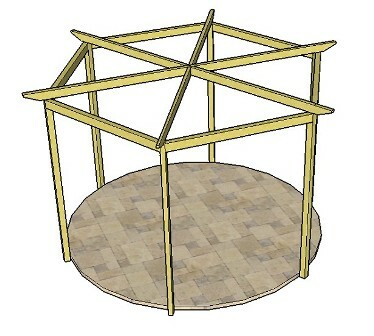 This diagram shows how the radiating rafters fit onto the pergola frame, with an option to add six or twelve spokes. All the necessary templates are included within the plans. These include the rafter tail templates to give a decorative effect to the rafter tail ends, a template for cutting the angled centre spokes, and also templates for the optional hexagonal braces at the centre apex and for the braces on the frame. This will allow for much quicker marking, and will mean that you can get your pergola up in super-quick time! Is it possible to build a pergola like this yourself? When I write my plans, I do it with beginners in mind. It was always my intention to make the building of these fabulous features possible even for someone who has never picked up a drill before! They include step-by-step instructions for this particular pergola design. There are plenty of drawings and diagrams at every stage. You don't need to be a structural engineer to understand the plans! All the necessary templates are included. Links to the tools and material lists are provided. You are welcome to ask for advice, using the contact form. The plans are available for you to download immediately. They are in pdf format can be viewed with Adobe Reader (links to this are given in the download process). 'Open' the download, and once downloaded, you will be able to save them to your computer. 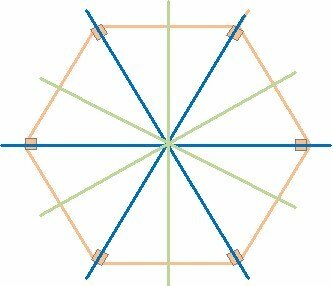 The pitched roof hexagonal pergola plans, along with the two flat rafter designs - six and twelve spokes. 18 free rafter tail temples. Construction templates for the braces and centre joints. Just click 'Add To Cart' below and it will take you through the download process. If you would prefer the plans for just the flat rafter styles, download those plans here. Add all kinds of interesting accessories to your area to make it a wonderful haven in your garden. 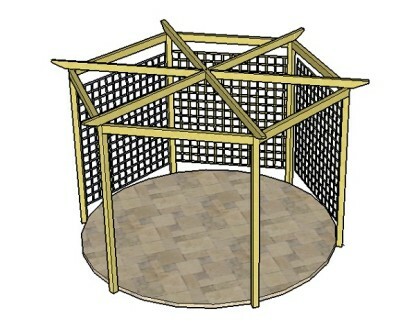 Don't forget to send in pictures of your pitched roof hexagonal pergola when you have finished. We all want to share in your amazing achievement!